5....5 burns done. Half a decade of playaventures and over a month of combined time in the dust. It is surreal to think how much we put in to being together for just one week a year. Those that do it right take all year (or longer) to complete art projects, make costumes outfits, prepare gifts, etc. In fact for a handful of die-hard burners it is an all consuming ordeal. Admittedly I am addicted to it. Though anyone that has been keeping track of the last 4 burns can probably assume so by now. This particular year I was specially looking forward to my journey back home. Its been a bit of a crazy 12 months and the thought of turning off the phone for a week, disconnecting, and removing the outside world was very welcome. 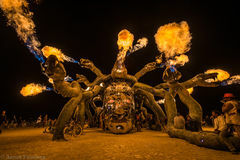 The truth is that is one of things I love best about Burning Man. How often do we forget our connectivity and devices and just be? Honestly, without this week I would never. In fact I'm completely connected most of the time, sometimes working on a laptop and a desktop (with 2 monitors) at the same time. So yes, this year was badly needed. The goal personally was to take more intentional photographs. Not that I havent shot enough in the past (which is kinda true), but to go out and really make an effort to shoot. Of course best laid plans....but...it seems that each year my 'best of' grows. And while I would like to keep it at 100, again it was not possible. Yay! My playa gift is in capturing our time out there so I feel it best to show what I can. Though, it seems that my Playa Portraits series was a bit lacking this year...which brings us to next year's goal! (Well at least one of them). Can never really seem to get this Burning Man thing right ;) More practice! While we're just finishing up 2016 I hope that these images bring back some dusty memories for those that have been and inspire the unknown for those that have yet to join us!